Jenn and Romy: Canadian Rockies are HUGE! Since the last post we were still in Glacier NP at Polebridge. Now we are in Eureka, Montana. We left Polebridge and drove down the Going-to-the-Sun Road, which took about 2 hours, and was very nice. It winded up and inbetween the mountains. We stopped somewhere along the middle of the road deep and high into the mountains to make lunch. We were planning on camping somewhere towards St. Mary's Lake at the east end of the park, but there was no room or something, so we decided to head North to Canada! We crossed the border, after our poor VW bus was searched by two Canadian officers. They found nothing, of course, and it was quite funny how they were struggling to open the fridge!!! After a minute, they gave up and never opened it to see the beer we had inside. Hehehehe. 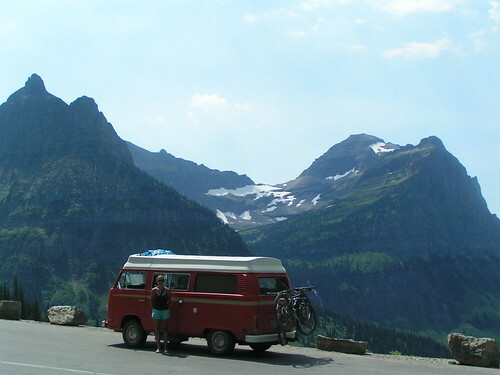 We camped out at Belly River campground in Waterton Park (the Canadian side of Glacier NP). There Romy finally gave in to washing up in the river after not showering for about 4 days. The water was not too cold. Anyways, the next day we made it to Banff, and camped out near Lake Louise. The Rockies up there are much higher! Almost 13,000ft peaks. In Glacier the peaks were about 9-10,000ft. We drove through Banff NP along the Icefields Parkway, which was a long chain of high mountains with huge icefields on top of then. We went by the Columbia Icefield and saw/walked on a glacier. 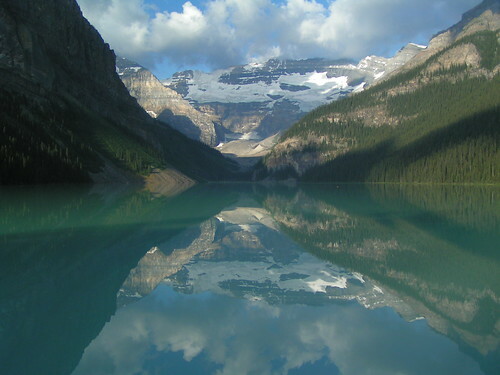 Later that day we made it to Jasper, had coffee, and moved back down to Lake Louise. That day was a lot of scenic driving. On that day we saw a ton of wild animals, most notably a black bear, a GRIZZLY bear, bighorn sheep, and mountain goats. The only animals we were missing were a cougar and a wolverine. So now we are back from Canada and we will be staying around Eureka, Montana for a few days. Tonight we reserved a night at Webb Mountain lookout cabin, which was used in the 1950's and beyond as a lookout tower for wildfires. Now it is not used and people can rent it for up to 7 days from the Kootenai National Forest. Thats it so far! See our pics on the flickr site!! !